Esiste un gene, chiamato MET, che svolge un ruolo fondamentale processo di formazione e di progressione dei tumori. Oggi, lo stesso gruppo di ricercatori che ha contributo alla scoperta di questo gene, compie un nuovo passo avanti nella comprensione di come i tumori si sviluppino e progrediscano fino a formare nuovi tumori (metastasi). Oncogene. 2008 Jan 24;27(5):684-93. Epub 2007 Aug 6. Silencing the MET oncogene leads to regression of experimental tumors and metastases. Corso S, Migliore C, Ghiso E, De Rosa G, Comoglio PM, Giordano S.
Division of Molecular Oncology, Institute for Cancer Research and Treatment (IRCC), University of Turin Medical School, Candiolo, Torino, Italy. In spite of the established knowledge of the genetic alterations responsible for cancer onset, the genes promoting and maintaining the invasive/metastatic phenotype are still elusive. 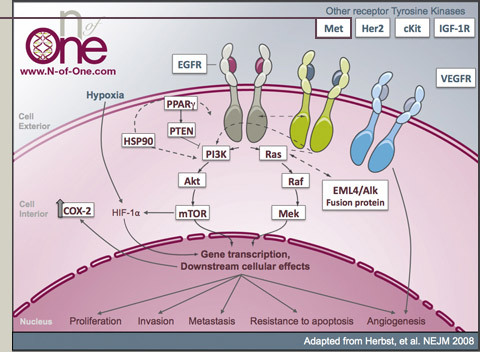 The MET proto-oncogene, encoding the tyrosine kinase receptor for hepatocyte growth factor (HGF), senses unfavorable micro-environmental conditions and drives cell invasion and metastasis. MET overexpression, often induced by tumor hypoxia, leads to constitutive activation of the receptor and correlates with poor prognosis. To establish the role of MET in different phases of tumor progression, we developed an inducible lentiviral delivery system of RNA interference. Silencing the endogenous MET gene, overexpressed in tumor cells, resulted in (i) impairment of the execution of the full invasive growth program in vitro, (ii) lack of tumor growth and (iii) decreased generation of experimental metastases in vivo. Notably, silencing MET in already established metastases led to their almost complete regression. This indicates that persistent expression of the MET oncogene is mandatory until the advanced phases of cancer progression.